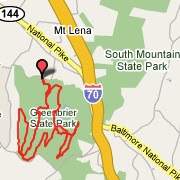 Greenbrier has mostly double trails with maps at intersections. Some long climbs and some nice descent. A few sections are rocky but less technical comparing to Gambrill. XC bikes are more appropriate here than long travel bikes. It is doable on a full rigid singlespeed.